(NaturalNews) Pesticide manufacturers reached an agreement with the Environmental Protection Agency (EPA) to stop the sale of chlorpyrifos, a powerful toxicant used as an insecticide in homes, lawns and gardens more than 14 years ago, due to associated health risks, according to a written report by Beyond Pesticides [PDF]. Chlorpyrifos are banned for use in homes, except in containers with treated baits. The organophosphate insecticide, a chemical created by Dow AgroSciences in 1965, is shockingly still used widely in agriculture, killing a variety of pests including rootworms, cockroaches, beetles, fire ants and many other insects. It's also used on golf courses, and to control fire ants and mosquitoes for public health purposes, according to the National Pesticide Information Center. 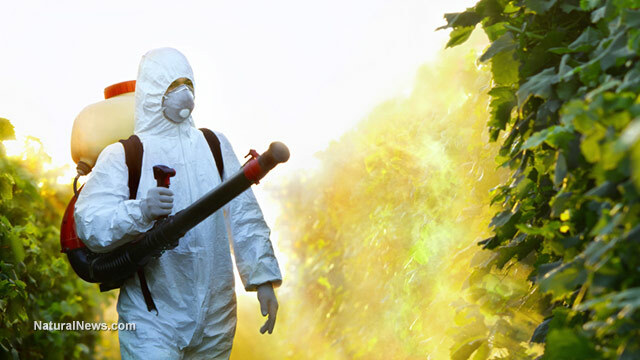 Chlorpyrifos are applied to grain, cotton, fruit, nut and vegetable crops and is registered for direct use on turkeys and sheep, dog kennels, horse site treatment and commercial establishments. Due to its highly toxic nature, state pesticide regulators in California are seeking to limit the widely used chemical based on concerns that it poses an immense threat to people and the environment. Applied to more than 60 different crops in California, chlorpyrifos are dangerous because they readily evaporate from leaf and soil surfaces, becoming airborne and morphing into a gas under high temperatures. These chemical drifts, capable of traveling far from its source, are believed to be responsible for chemical poisonings in California's Ventura, Tulare, Merced and Madera counties, according to the Pesticide Action Network. More than 136 people were exposed to chlorpyrifos drift between 2001 and 2011, according to the California Department of Pesticide Regulation. The proposed restrictions would grant county commissioners the authority to require anyone applying the chemical to be trained and certified and to obtain a permit before spraying, reported The Fresno Bee. Proximity to schools, homes and other public buildings will be considered by county commissioners in order to prevent drifts. Under the proposal, applications to use the chemical can be denied depending on conditions. "What we try and do is to head off any potential problems," said Tom Tucker, Tulare County's agriculture commissioner. "And if need be, we can deny the permit if the conditions are not right." Chlorpyrifos work by blocking enzymes required for controlling nervous system signals. Low-dose exposure in humans may result in headaches, agitation, inability to concentrate, nausea, diarrhea and blurred vision. High doses can cause respiratory paralysis and death. Studies have shown that even low doses can interfere with nervous system development, placing children at a higher risk for complications. Infants born to mothers exposed to chlorpyrifos suffered from attention deficit disorder, low birth weights, reduced head circumference and other extensive and unusual birth defects, studies found. In animals, the chemical transforms into chlorpyrifos-oxon, which is about 3,000 times more potent. It accumulates in fish and crops, and can remain on plants for up to two weeks, making poisoning through food consumption way too likely. In 1999, the Health Effects Division of the EPA reported that chlorpyrifos were one of four pesticides responsible for symptoms in children and adults that resulted in hospitalization and death. Further, Dow AgroSciences and other manufacturers have sent about 7,000 reports of chlorpyrifos-induced reactions to the EPA since 1992. Based on substantial research, chlorpyrifos should be absolutely without a doubt completely banned for all intended purposes. Its very existence disrupts the quality of life for humans, animals and plants. While California's proposal is progressive, it's extremely far from where we need to be in terms of allowing this chemical to still be used. Thankfully, a coalition of environmental groups sued the EPA this week seeking to remove chlorpyrifos completely from the market.